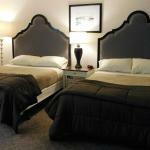 Capri Motel is set in Walla Walla and features a seasonal outdoor swimming pool. With a garden the 2-star motel has air-conditioned rooms with free WiFi. Free private parking is available on site. All rooms come with a flat-screen TV with cable channels a coffee machine a bath free toiletries and a desk. Rooms are complete with a private bathroom equipped with a hairdryer while certain rooms at the motel also have a terrace. The rooms have a wardrobe. The nearest airport is Walla Walla Regional Airport 2 km from the property.